What Type of Grow Light Would I Use for a Meyer Lemon Tree? I want to give my lemon tree some extra light when I can't take it outside and I don't know what type of light I need. If you are just looking to overwinter a plant, a standard florescent bulb placed 6-12 inches from the plant will suffice. It does not provide a complete light spectrum, but it is enough for a plant for a few months over winter. If you are looking for a light to help plants over an extended period of time, you will need to get a full spectrum, "grow" light. It will provide the red and blue spectrum that plants need in the long term. 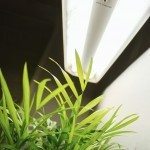 It looks just like a florescent light, but will be marked as a plant light and will cost a good deal more than your standard florescent bulb. As with the florescent bulb, it needs to be close to the plant to be effective.